1920s and early 1930s ties were all about texture, simple designs and were very much an understatement as far as a mans entire outfit went. It wasn’t until mid 1930s to 1940s that ties with wildly colourful and bold designs became more popular. Either tie style can produce a fabulous vintage look, but the ties should make sense with the rest of the outfit. Necktie widths grew wider (about 3.5 inches) and shorter to go with the wider suit lapels and oversize shirt collars of the 30′s and silk ties dominated as did brocade. 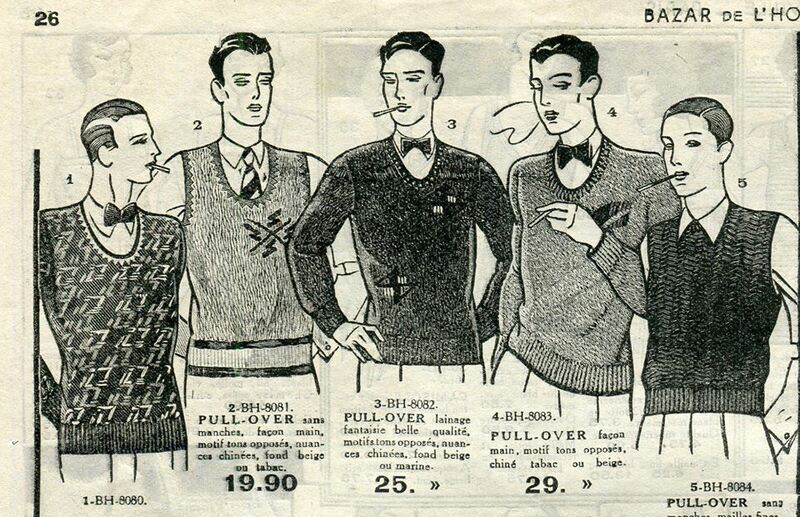 In the 1920s and 30s there were very few men who would have worn a long tie without wearing a vest, coat, or jumper as well. A tie under a vest looks very suave and I was told by vintage tie expert at and Art Deco convention a few years ago that if you tie your tie and the thin end ends up longer than the front end – do not fret! Apparently this was common back in the day and men would sometimes tuck the tie into their waistband. Boldly coloured ties with crazy designs in rayon and poplin became hugely popular in the 1940s and were used by men to express themselves in world of suits and formality. In the 40s, high-cut trousers meant that mens ties became shorter and wider. If you wear a 1940s tie with modern lower cut trousers, you should leave at least two buttons above the waist uncovered. If you are trying to tie a vintage tie from the 1940s or 30s, you should use the the four-in-hand knot (see below). It fits the longer collars of the 30s and 40s that had a narrower spacing. It’s also still the knot favoured by discerning tie-lovers. * Thank you to reader Roger for his info re what knot would have been used the 30s and 40s. Here are some ties that are currently for sale in my Etsy store. I found a bunch of great things for my Etsy store at a huge antique fair on the weekend, from 1950s lucite hair clips to an amazing satin 1930s gown. Here is a wee sample. They are all linked back to the shop if you are interested. From a 1936 edition of the Cleveland Plain Dealer, advising readers how to “look smart” while attending the Great Lakes Exposition, suggesting various ways to wear the illustrated fashions. Posted on 13 August 2012 17 October 2013 Author MichelleCategories Clothing, Hats, In Magazines, Men's FashionTags 1930s fashion, 1930s menswear3 Comments on Want to look smart?